Diagram of a simple filtration. Filtration is a mechanical or physical operation by which solids are separated from fluids (liquids or gases) in a mixture with the help of a medium that is called a filter. When the mixture is brought in contact with a filter, the filter allows the fluid to pass through, but it retains at least part of the solid material. The fluid that passes through the filter is called the filtrate, and the solid material that remains on the filter is called the residue. Depending on the application, either one or both components may be isolated. Filtration methods are often used to remove harmful substances from air or water, such as to reduce air pollution or to make water potable. Chemists often use filtration to separate materials of different chemical compositions. On an industrial scale, filtration is used by the oil, gas, food and beverage, and pharmaceutical industries, among others. Municipalities use filtration techniques when treating sewage and purifying water. The filtration process separates solid particles from a fluid in a suspension, and the fluid can be either a liquid or a gas (or a supercritical fluid). There are various methods of filtration. 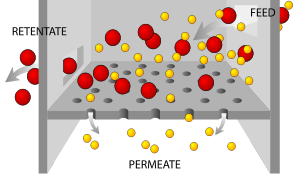 In each case, the particles to be removed are trapped by the filter, while the fluid passes through it. The simplest method of filtration is to pass a suspension of a solid in a fluid through a porous interface so that the solid is trapped, but the fluid passes through. This principle relies on the difference in sizes of the particles that make up the fluid and those that make up the solid. In the laboratory, a Büchner funnel or Hirsch funnel may be used, with a filter paper serving as the porous barrier. For example, an experiment to demonstrate the existence of microscopic organisms involves the comparison of unfiltered water with water passed through unglazed porcelain. When left in sealed containers, the filtered water takes longer to go foul, showing that even microscopic organisms (such as bacteria) can be removed from fluids by appropriately designed filtration. Some methods are based on the principle of electrostatic attraction between oppositely charged particles. These types of filters may become clogged, or their active sites may be filled by the unwanted materials. However, most chemical filters are designed so that the filter can be flushed with a chemical that will remove the unwanted materials, allowing the filter to be reused. To separate a mixture of solid chemical compounds, a chemist may choose a solvent that dissolves one component but does not dissolve the other. When this mixture is filtered, the component in solution passes through the filter, while the other is retained by the filter. This is one of the most important techniques used by chemists to purify compounds. Alternatively, if several compounds are in solution, the chemist may add a reagent that precipitates one or more of the compounds. The mixture may then be filtered to separate the precipitate from the dissolved materials. To separate solid particles from a liquid, the easiest technique is to allow the liquid to flow through the filter by gravity. For chemical plants, this is usually the most economical method. In the laboratory, pressure in the form of compressed air may be applied to hasten the filtration process, although this may clog the filter or allow the passage of fine particles. Alternatively, the liquid may be drawn through the filter by the use of a pump. There are two main types of filter media: A solid sieve that traps the solid particles, with or without the aid of filter paper; and a bed of granular material that retains the solid particles as they attempt to pass through. The first type allows the solid particles (that is, the residue) to be collected intact; the second type does not permit this. However, the second type is less prone to clogging because the particles can be trapped over a greater surface area. Also, when the solid particles are very fine, it is often cheaper and easier to discard the contaminated granules than to clean the solid sieve. Filter media can be cleaned by rinsing with solvents or detergents. Alternatively, in engineering applications, such as swimming pool water treatment plants, they may be cleaned by backwashing. Examples of the first type include filter paper used with a Büchner funnel, Hirsch funnel, or other similar funnel. A sintered-glass funnel is often used in chemistry laboratories because it can trap very fine particles, and the particles can be removed with a spatula. Examples of the second type include filters at municipal and swimming pool water treatment plants, where the granular material is sand. In the laboratory, the filter bed may be formed from Celite (diatomaceous earth or kieselguhr) packed in a Pasteur pipette (microscale) or loaded on top of a sintered glass funnel. Certain filter aids may be used to assist the filtration process. They are often inorganic mineral powders or organic fibrous materials. Examples include diatomaceous earth, wood cellulose, and other inert porous solids. These filter aids can be used in two different ways. They can be used as a precoat (on the filter medium) before the slurry is filtered. This prevents gelatinous-type solids from plugging the filter medium and it gives a clearer filtrate. Alternatively, they can be added to the slurry before filtration. This increases the porosity of the cake and reduces resistance of the cake during filtration. In a rotary filter, the filter aid may be applied as a precoat; subsequently, thin slices of this layer are sliced off with the cake. The use of filter aids is usually limited to cases where the cake is discarded or where the precipitate can be separated chemically from the filter. It is important not to confuse filtration with sieving. In sieving, there is only a single layer of medium where size separation occurs purely by the fact that the fraction of the particulate solid matter which is too large to be able to pass through the holes of the sieve, (scientifically called "oversize") are retained. In filtration, a multilayer medium is involved, where other mechanisms are included as well, for instance direct interception, diffusion, and centrifugal action, where in this latter those particles, which are unable to follow the tortuous channels of the filter, will also adhere to the structure of the medium and are retained. Filtration methods are used in the home, in research laboratories, in industrial processes, and in controlling environmental pollution. For example, a coffee filter is used to separate brewed coffee from the grounds, and HEPA filters are used in air conditioners and vacuum cleaners. Some filters are used to clean ambient air by removing dust from the atmosphere. Chemists often use filtration to separate materials from mixtures of different chemical compositions. On an industrial scale, filtration is used by the oil, gas, food and beverage, and pharmaceutical industries, among others. Municipalities use filtration techniques when treating sewage and purifying water. Filtration cleans up river streams or other water streams. Furnaces use filtration to prevent the furnace elements from fouling with particulates. Pneumatic conveying systems often employ filtration to stop or slow the flow of material that is transported, through the use of a baghouse. The kidney works by filtration of blood in the glomerulus, followed by selectively reabsorbing many substances essential for the body. Filtration is a more efficient method for the separation of mixtures than decantation, but it is much more time consuming. If very small amounts of solution are involved, most of the solution may be soaked up by the filter medium. An alternative to filtration is centrifugation—instead of filtering the mixture of solid and liquid particles, the mixture is centrifuged to force the (usually) denser solid to the bottom, where it often forms a firm cake. The liquid above can then be decanted. This method is especially useful for separating solids that do not filter well, such as gelatinous or fine particles. These solids can clog or pass through the filter, respectively. ↑ Lecture notes, Postgraduate course on Filtration and Size separation at the Department of Chemical Engineering, University of Lougborough, England. Cheremisinoff, Nicholas P. 1998. Liquid Filtration, 2nd ed. Boston: Butterworth-Heinemann. ISBN 0750670479. Meltzer, Theodore H. and Maik W. Jornitz. 2006. Pharmaceutical Filtration: The Management of Organism Removal. Bethesda, Md: PDA. ISBN 193011477X. Sutherland, Ken. 2007. Filters and Filtration Handbook, 5th ed. Oxford: Elsevier. ISBN 978-1856174640. Tech Brief: Filtration. National Drinking Water Clearinghouse. This page was last modified on 10 April 2017, at 17:59.